Pflugerville, TX - For those who have ever played golf in Austin and the Central Texas area, trees are a big part of that experience. It is only on rare occasions and certain courses that trees aren't a large factor in course management and in the end, your final score. 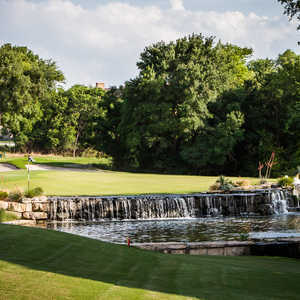 One such course is Blackhawk Golf Club in Pflugerville, just 20 minutes northeast of Austin. This links-style course does have some trees, but compared to other courses in the area, they are few and far between. This lack of hardwood is no more evident than on the first hole, a par 4 of 414 yards that is straightaway. Several very small trees dot this first 419 Bermuda fairway but they only come into play if you are short off the tee and very unlucky. The real concerns on the first hole are a pond to the right and a creek that crosses about 100 yards in front of the green. The green, which is Tifdwarf Bermuda, slopes back to front and has several bunkers protecting it in front to the left and right. The next two holes - the par-5, 535-yard No. 2 and the par-4, 387-yard No. 3 - make up two-thirds of the holes on the front side with trees that come into play. No. 2 is a long dogleg to the left that features a drive off a tee to a fairway that features several large rolling hills on the left and a couple of trees at the bend - one in the middle and several to the right. If on your drive you are able to cut the corner and manage to clear the trees, you are faced with a decision - go for the green in two and attempt to clear a creek 30 yards in front of the green with a shot of more than 200 yards, or lay up to about 100 yards out for a sand wedge in to the green. Most opt for the latter. No. 3 is another challenging hole with trees in play. This dogleg-right plays more difficult than its relatively short distance of 387 yards. Because of a line of trees to the right that curves around in front of the tee, there are no shortcuts on this hole. Instead, you must follow the hole design and aim left of the green and a group of large mounds on the right. A dry creek crosses approximately 200 yards out from the tee and can create some problems if you manage to find it. In addition to the trees to the right and the creek, several more trees lie on the left of the fairway and a large bunker lies in the middle of the fairway on the other side of the creek. If you successfully clear all these obstacles off the tee, you have a short iron remaining to a green that is protected by several bunkers. Upon reaching the green, your work is not done. Depending on the hole placement, getting down in two can be difficult because of a large ridge that crosses this green, which slopes back to front. The next five holes on the course, which was designed by three-time U.S. Women's Open champion Hollis Stacy and opened in 1992, almost feel like you've moved to a different course. All five are wide open and include water, sand, brush/out of bounds - and on some holes - all of the above. Unlike the early holes, there are no trees. Of this stretch of five holes, No. 5 is most scenic and most challenging. This par 3 of 199 yards is tough. Water runs along the entire left side of the fairway and juts out in front of the green on the left. Most tend to leave their shots off to the right whether the pin is placed to the left or not. Be bold and go at the flag. It's only water. After finishing play on the wide open holes on the front side including the short No. 8, a 160-yard downhill par 3, you are confronted with the most challenging hole on Blackhawk, and incidentally, the signature hole. The par 4, 464-yard No. 9 could be considered the signature hole because it definitely leaves a mark on your score. In reality, No. 9 has earned that title because it is easily the most difficult hole on the course and it provides a picturesque view heading toward the clubhouse before your make the turn. Water, which can be found on 13 holes, and trees are two big challenges on this hole. Off the tee there are two separate places where your ball can find a watery grave including a pond that lies to the left, while the same creek that crosses in front of the No. 1 green crosses diagonally on No. 9 approximately 215 yards out from the tee. This creek and a large bunker and a larger tree to the right of the fairway make it almost impossible to clear the creek off the tee. With that, you are left with a second shot of 200-plus yards to a green that is protected by a small pond to the left. On the back nine, the terrain continues as it finished on the front with gently rolling hills and prairie land. The prairie land has been replaced in recent years with houses on many of the holes, but it can still be seen on many holes. No. 13 is one such hole but it is better known for its unique design. Out of the box this par 5 of 533 yards looks rather harmless as it is one of the flattest holes on the 7,103-yard layout. The fairway is generously wide and no real hazards are in play. Because it is a dogleg to the left, you can cut the corner and shave off a considerable amount of your distance remaining to the hole. However, it's the second shot that definitely makes this hole a thinking man's hole. Several small ponds - one to the right and one to the left that crosses in front of the green - sit waiting for an errant second shot that will be coming in from at least 200 yards out. Your best bet is to lay up short of the ponds and approach with your third. In contrast to No. 13, No. 14 is one of the easier holes at Blackhawk, which hosts on average 40,000 rounds per year. A par 4 of 385 yards is mostly downhill. Several small trees sit on the right of the fairway with a group of rolling hills. A tee shot down the right side will roll back to the left and leave a shot of no greater than 140 yards to the green. But be careful, this green, which is protected by two bunkers, requires a soft landing. Anything that hits hard will roll all the way back or past on the tilting front-to-back slope green. Heading home, Nos. 17 and 18 are two nice finishing holes. No. 17, a par 5, 551-yard dogleg to the right features a tee shot to a blind landing area that is bordered on the backside by water. You can, like No. 13, cut off the corner and leave yourself a shorter second shot. Whatever route you take, your second shot is another blind shot uphill to a green protected by several bunkers and mounds. To finish your round, No. 18, a 430-yard, par 4 forces you to make a choice off the tee - a driver that is straight or a shorter club with a little leeway for error. Off the elevated tee are two more ponds, one to the right and one to the left. Both are easily reachable with any wood. However, if you are able to place the ball where you want, you can split the two ponds down the fairway and leave yourself a short iron into the green. Upon completion of your round at Blackhawk, especially if you've played other Austin-area courses, you will have a great appreciation for the uniqueness of Blackhawk's links-style design. Amenities: Putting green, chipping green and a driving range. Directions: From Austin: Travel north on IH35 to exit #247 (1825). Go east through Pflugerville, then north 2.5 miles on FM 685 to Kelly Lane. Blackhawk is .8 miles east on Kelly.